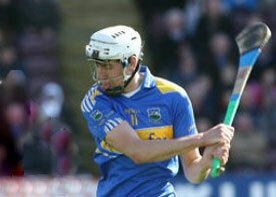 All-Ireland senior hurling champions Tipperary have been dealt a serious blow with the news of a fresh injury. Star forward Patrick ‘Bonner’ Maher has now been ruled out of action for a month with a broken bone in his hand. Maher, who scored four valuable points against Galway in last Sunday’s Allianz NHL victory, appears to have damaged his right hand in the closing stages of the match. The severity of this injury has now been confirmed by medical scans yesterday. The 21 year old star performer, Maher, will now miss Tipperary’s final National Hurling League outing against Wexford at Semple Stadium on Sunday week, April 17. Maher however is not expected to be missing for Tipperary’s Munster SHC quarter-final against Cork at Semple Stadium on May 29. Meanwhile, the 2010 Hurler of the Year and two-time All-Ireland SHC medallist, Lar Corbett, has opened his new business venture at Coppinger’s Bar, 4 Parnell Thurles, Co Tipperary. Lar Corbett’s Bar will be officially opened by former Tipperary senior hurling team manager Liam Sheedy at 8.00pm on Saturday, April 16th next, with Paul Collins of Today FM acting as MC on the night.